It has split the country into 44 areas and the relevant local authorities are working with the one provider accredited for rolling out the technology, BT, to figure out their plans. By the end of July 2013, 29 councils had already signed contracts with the telecoms firm and BDUK, BT and the local authority have details of where the fibre would reach – and where it wouldn’t. Both BT and BDUK have given permission to councils to publish the data and culture secretary Maria Miller has even written to them to urge the release of the data as soon as possible, but still many are delaying. So Computer Weekly has launched its own investigation to find out the locations set to benefit from the BDUK roll-out – and those set to lose out. Below are all 44 areas defined by BDUK. DCMS has told us each council which has signed a contract holds a list of postcodes where the roll-out will occur and Computer Weekly is seeking to obtain this data as soon as possible. Computer Weekly will be update this page regularly with the latest information on where the roll-out will take place. Bookmark this page and come back regularly for updates to the project and as much data as we can get hold of. If you have any information you want to share with us, email jscott@techtarget.com or contact on Twitter @NifS. The local council has published a map where residents or businesses can check broadband availability and the future for getting superfast broadband on its website. UPDATE (10/12/13): Devon and Somerset councils this week named 31 parishes where superfast broadband would be live by the end of March 2014: Bishop's Hull, Bridford, Chilton Trinity, Christow, Combe Florey, Comeytrowe, Corfe, Cotford St. Luke, Crediton, Dunchideock, Exminster, Hatherleigh, Hemyock, Newton St. Cyres, North Tawton, Nynehead, Okehampton, Okehampton Hamlets, Petrockstow, Ruishton, Sampford Arundel, Sandford, Shillingford St. George, Shobrooke, South Tawton, Stoke St. Gregory, Thurloxton, Trull, Wembdon, West Buckland and West Monkton. The councils have also updated there online coverage map with further details, which can be found here: http://www.connectingdevonandsomerset.co.uk/where-and-when. The CEO of NYnet – the organisation created by the council to carry out the roll-out – John Moore, told Computer Weekly that, as one of the pilots of the roll-out, it is not operating on the same framework as other local authorities. Moore claimed the use of postcodes to outline areas which will be getting the fibre is not always effective as certain small villages may fall into one, but still be too far from the cabinet to get the 25Mbps connection promised by the council. There is some information already available on the North Yorkshire website but they are currently holding a full review of the roll-out and will be updating this data sometime in August. UPDATE ONE: NYnet has come back to us to explain more about its roll-out. The way its contract with BT differs to other BDUK deals is it only requires 77% of its 'intervention area' to be covered by superfast broadband. Commercial entities, such as Virgin Media, will make this up to 90% as per the government's original target. The other 10% - roughly 40,000 premises - will get 2Mbps but NYnet is hoping additional funding from the government and alternative technologies will bring these up to speed by end of 2014. It has shared a map with us showing the unshaded areas accounting for this 10% and where the other roll-outs will take place. It plans to add details to this map of how those 2Mbps areas will reach superfast speeds this month as it continues its review. UPDATE TWO: North Yorkshire has come back to us with a new, updated map that shows the planned 90% of the area set to get superfast broadband. The organisation was keen to stress the map shows where people will be receiving superfast broadband based on their distance from cabinets. Moore said: "In general terms, premises within 1200m of a cabinet will receive superfast broadband speeds in excess of 25Mbps. We are aware that in other counties, this level of sophistication has not been applied, using instead, the mapping of postcode areas." "We are of the opinion that postcode mapping significantly overestimates the coverage that broadband technology can achieve (the laws of physics do apply), and had we have used this approach we risk incurring the consequent disappointment of a significant number of residents and businesses in our communities." The organisation is seeking more funding and hopes to up coverage to 95%, but will update the map accordingly if it secures it. Surrey has published a map on its website showing all the areas that will receive superfast broadband and when, as well as promising to get in touch with both residents and businesses who fall outside of these areas to talk about alternative solutions. Although the council has still not responded to our requests, a representative from Ewhurst Broadband has sent us a link to a published postcode list, which can be found here: http://www.ewhurst-broadband.org.uk/wp-content/uploads/2013/02/postcode-check-2-Sheet44.pdf. The council has sent us a map showing where the BDUK roll-out will and will not be going. For Gloucestershire the project end date is Dec 2015 and for Herefordshire Dec 2016. The roll-out across both counties will be phased though, so some areas will go live before others. Residents can also use the post code checker on its website. First 30 areas to get the roll-out are listed on the betterbroadbandnorfolk.co.uk website, with more being added every two months after a full survey of the county is completed. Cambridgeshire plans to publish a map in September with an A-Z list of where the fibre will be available. However, the council claims BT has defined some of the information as commercially sensitive and therefore not for general release. UPDATE: Cambridgeshire has still not shared the postcode data with us but sent us an update today, having published a map on its website and given more specific details of roll-out within 267 parishes. All the details can be found here: http://www.connectingcambridgeshire.co.uk/map/. A spokeswoman added: "The Connecting Cambridgeshire broadband roll-out remains on track with work already underway to install some of the first street cabinets so they are ready to go live with fibre before the end of this year." Lincolnshire has been very open and published plans for commercial roll-out, BDUK deployments and a much smaller ERDF-funded fixed Wi-Fi project on some parts of the coast on its website. Northamptonshire has published a map with the areas that will get fibre as part of BDUK on its website. Durham County Council has already published a postcode checker on its website so residents and businesses can find out if their area will be covered by superfast broadband. However, it told us that this was not the complete picture and a full roll-out map would be published in Autumn. Cheshire claims it hasn’t established the areas yet and is undertaking the survey now, so it can release details in December. Computer Weekly is waiting to hear back about the postcode list the DCMS claims the council has. UPDATE: Cheshire has published a map with some details around which exchanges will be enabled and rough timescales for when they will go live here http://www.connectingcheshire.org.uk/check-availability but has still yet to share postcode data. UPDATE TWO: A spokesperson for Cheshire East Council emailed Computer Weekly on 25/11/13 and said: “Until our very detailed survey work with BT Openreach is complete, there is no definitive or accurate postcode data that can be provided." Sean Brennan, the Northern Lincolnshire Broadband project manager, told Computer Weekly the areas are being verified but the council is chasing some additional funding which will need to be modelled in, as it means extended coverage. The council has signed the contract with a maximum area that can be covered, but is now trying to establish how much of that it can reach. Brennan admitted the council does hold the postcode data but said he does not want to publish it until the council is sure about additional funding. UPDATE: We have received a response to our FOI request asking for the postcode data, which again has been denied. The response said the council was going through a modelling phase right now - despite us already knowing it has the postcode data set down - and a map would be published by early October. We have gone back to the council saying this is not satisfactory and are waiting for them to come back to us, hopefully with the data this time. UPDATE TWO: We have received a rather rude response to our complaint making it very clear we would not be getting the data. Brennan said: "Local authorities have been encouraged by the Secretary of State to publish their rollout plans. We are doing this as soon as our plan is complete. As to when and how we publish this, it is explicitly stated by the Secretary of State that this is a matter for local authorities to decide." UPDATE THREE: The council has published a map detailing the roll-out plans and an accompanying PowerPoint presentation detailing when the phases will be. However, it is still not giving out postcodes or premises details, stating it is “not possible” to do so. Scotland has promised to publish initial coverage maps and that they will be "available shortly". Scotland has yet to follow up with the request for postcode data, but said it will be included in this format when the data is published. UPDATE: We are still waiting for a full response to our FOI request but have received an email apologising for the delay, blaming it on "the commercial in confidence issues" involved - meaning there is still some issue with the confidentiality clause in the contract, despite BT's protestations there should be nothing in there to hold up the publication of data. UPDATE TWO: We have now had a formal response to our FOI request (09/10/13) and yes, the Scottish government is refusing to publish the postcode data as it is deemed 'commercially sensitive' both under the act and within its contract with BT. It is set to launch the www.scotlandsuperfast.com website in the next couple of weeks and has promised to develop the site with interactive maps and postcode checkers in the future, but this isn't expected until at least 2014. We are going to complain about the response and try to force this data out of the government, but it will take a further 40 days for them to respond and we have to physically write to them rather than email, so don't expect anything too quickly. "We recognise that there is some public interest in release as part of open and transparent government and to help account for the expenditure of public money. However, this is outweighed by the public interest in protecting the commercial interests of a business such as BT, which is a supplier to government and, as in this case, a major co-investor in an important infrastructure project." So, protecting BT's commercial interests is more in the public interest than being open and transparent with the public. We have been contacted on Twitter and sent a link to the Superfast Lancashire website, which details some of the details of where the roll out will be taking place. However, it still hasn't confirmed all of the areas due to either get, or not get, superfast broadband. The council is holding back publishing data as it said it received additional funding for the project 'as the contract was signed.' This meant more areas would be getting the fibre than initially planned. It hopes to release the full data in the second week of September, but we are waiting to hear back on whether we can have the postcodes of the initial roll-out to give people a better understanding of where the fibre will go. UPDATE: We have just received another correspondence from Hertfordshire which admits it holds the postcode information, but says it is withholding details on speed and coverage of the roll-out to protect commercial interests, citing section 43 (2) of the Freedom of Information Act. The council promised maps showing the rough areas of the deployment would be live on its website by Monday 16 September. 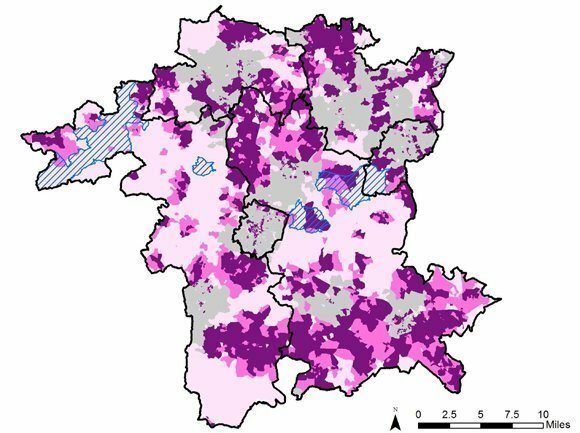 Warwickshire County Council has published 'an indicative map' on its website of where the roll-out will take place but claims it is still agreeing the details with BT, despite what the DCMS has told us. The council said it would be issuing information about each phase on a twelve-month rolling basis, with the first announcement due around the turn of the year. The county council claims having only just signed the contract, the surveying has yet to begin and won't start until Autumn. It then said the first communities to receive the fibre would only be revealed in the winter of 2013/2014. We have told the council what the DCMS has said and await for a reply with the list of postcodes. UPDATE: We have had a reply from the project lead of Superfast Dorset, Dugald Lockhart, saying they were taking this course of action based on advice from the DCMS. They still have yet to share the postcodes. 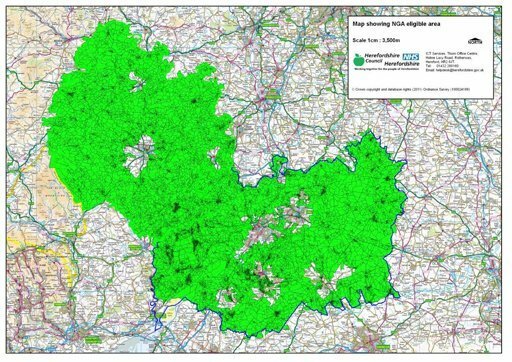 South Gloucestershire council came back to us and said the only modelling it had done so far was at "a very high level" so subject to change, but also said the contract it is currently bound by with BT means even that data is considered commercially sensitive. After the public accounts committee where BT conceded there was no reason for this not to be published, the council has been in talks with them and BDUK around what data can be made public and when. DCMS has told us the data can be published ASAP so we are pushing for South Gloucestershire to do this. Kent County Council told us it was "seeking urgent clarification" with BDUK on what it could publish due to "contractual obligations" with BT. The county council admitted it has agreed its plans with BT on where and when the fibre will be rolled out, but said the contract it signed deemed the information 'commercially sensitive' so it wasn't happy to share it. The council is in the process of "seeking urgent clarification" from BDUK of what it can publish. We have responded with what BT said in the PAC meeting and what DCMS has told us about the fact the information can all be shared and await a response. UPDATE: East Sussex came back to us today with a "high level roll-out plan at exchange level" but said it could not share data at postcode or premise level. What they have published is available on its website. Pauline Harris, the council's programme manager for the project, revealed whilst 90% of the county would be getting "faster speeds," she was unable to provide accurate enough details of where the places that would just be faster and those that would be superfast would be. A promise of a website where residents could search with their postcodes to find out whether they are in the roll-out areas or not would be coming within a few weeks, but it still did not share the postcodes the DCMS says it holds. UPDATE: Worcestershire County Council today published a map with 'provisional locations' of where it would be rolling out superfast broadband over the next three years. It said the full technical roll-out plan would be formed over the next nine months, which could lead to some changes to the published plans, adding to the bottom of the statement: "Please be aware that this map is for early indicative purposes only – it is not accurate at the premise or postcode level and should not be considered as such." The county council claimed it was still finalising details with BT, despite what DCMS has told us about having the postcode data for the roll-out. The spokeswoman promised the details would be made available on a yet to be launched website in September, but we are still trying to get the raw data before this. The response to our FOI request has been to cite section 22 - "information intended for future publication" - as a justification for not sharing it with us. The Welsh government undertook a review across the country to establish which areas were already being served by next generation broadband and which weren't, enabling it to create detailed maps of where it intervention was needed. It has now published those maps and, although it has signed its deal with BT, it still states "the market has an opportunity to put forward any further proposals or comments." We are waiting for a response to the postcode request of where BT plans to roll-out, however. The county council has published a number of maps on its website showing which areas are entitled to state aid due to a lack of commercial roll-out, but has yet to guarantee which will get the BDUK roll-out and which will miss out. The county council has published maps of its planned intervention areas on its website, with the caveat they are subject to change. We have also requested a postcode list and wait for its response. UPDATE: Essex County Council has refused our FOI for the postcode data citing section 43 (2), meaning it believes the need to protect the commercial interests of BT outweighs the public interest case. The county council has published a 'high level' map of the areas it expects to bring broadband to but admits it is not accurate to postcode or premise locations. We requested the postcode list but, despite the DCMS telling us every council has one, Derbyshire claimed it was at the early stage of its broadband project and did not yet have "an accurate list of postcodes or properties" that would be benefiting from the rollout. Despite what the DCMS has said, the county council claimed its survey wasn't due to start until October and the first locations wouldn't be announced until early 2014. However, BT was able to tell us around 2,500 premises were set to fall outside of the intervention area, meaning plans must have been made. We have submitted an FOI request to try and get the data. UPDATE: We have received a response to our FOI which, although it admits the council holds the data, refuses to publish it, citing section 22 - that the data is intended for future publication - and section 43 - protecting commercial interests - as its reasoning. UPDATE: A spokeswoman from Bedford Borough Council told Computer Weekly the councils had managed to secure more funding from BDUK so, as a result, have asked BT to re-map its plans. She said: "This will materially change the intervention area and so we are proposing to publish the information following this re-modelling exercise." The county council claimed it was still finalising details with BT, despite what DCMS has told us about having the postcode data for the roll-out, and planned to make the information available at the end of September. As with Staffordshire, the response to our FOI request has been to cite section 22 - "information intended for future publication" - as a justification for not sharing it with us. The joint forces of Leeds City Council, Bradford Metropolitan District Council, Wakefield Council and Calderdale Council have confirmed their contract with BT and published the below map outlining which areas they plan to cover. We have requested the finer details of postcode data today (09/09/13) and await their response. UPDATE: Leeds Council have responded to our FOI request refusing to give us the postcode data. It claims the proposed areas of roll-out "will not be finalised until a further detailed survey is undertaken" and has not even provided a timetable for this process, merely saying it will publish further details "in due course." We have had a response to the FOI request we sent to Oxfordshire County Council asking for the postcode data. It hasn't said no, but has cited section 43 (2) of the act which allows it to extend the time it has to response in order to balance the public interest of the data with the commercial interests of the company involved, namely BT. Rather than the 20 working days it should have responded in - we submitted the request on 21 August so should have had a response next week - the council has said it 'expects' to give us its final response by the 8 October. We wait with bated breath. UPDATE: Oxfordshire has finally returned to us with a somewhat complex response to our FOI. It has said the majority of the information I requested - namely the postcode data and the contract details - were set to be published on this website: http://www.oxfordshire.gov.uk/cms/content/get-involved-broadband-plan. However, it also said some details were being held back to protect the commercial interests of BT. The speed coverage template and wholesale access product template are both being partially withheld, whereas the likes of the reference supplier solution, project plan, test strategy and survey assumption sections of the contract are being kept completely private to protect BT. "In all the circumstances of the case, the Council considers that the public interest of maintaining the exemption outweighs the public interest in disclosing the information," it concluded. The county council ignored our initial requests but has finally come back to us after we sent in an FOI. It was still unwilling to share postcode data, becoming yet another council to cite section 43 (2) of the act, believing it would damage BT's commercial position if these details were released. It has launched a website giving more detail on which areas will be receiving coverage when: http://www.betterbroadbandsuffolk.com/LineCheck.aspx. But, despite having signed the contract with BT, Suffolk claimed there was still a lot of surveying work to be done to see if it was even possible to cover these areas from a technical perspective, so no more detail would be released. An update to the website has been promised by the end of September but, again, it is unclear how much more information this will lead to. The council claims it doesn't hold a 'final implementation plan' for the area and is only just about to start work with BT on the design of the network - a process is expects to take between six and nine months. We have submitted an FOI request to try and get the postcode data. UPDATE: The council has responded to our FOI request denying it holds a final implementation plan for East Riding. Instead it claims it is just about to start work with BT on designing the network and it will take six to nine months before any firm plans are in place. After not responding to our initial request for the postcode data, Northumberland County Council has now come back to us following our FOI request. Although it has admitted it holds the data, it has cited both section 43 (2) - protecting commercial interests - and section 22 - information intended for future publication - as reasons not to share it. The council claimed it was in discussions with BT as to what it could and could not publish, but wouldn't give a timeframe, only confirming some data would be released "in due course." "Northumberland County Council recognises that there is a general public interest in information held by public authorities being made available and that it should take place at the earliest appropriate time," read the response. "However, the public interest can sometimes be best served by the planned publication of information at an appropriate time rather than in response to an individual request for that information ahead of that time." "On balance, and in all the circumstances of this particular case, we have concluded that the public interest is best served by the planned future publication of the information you have requested and by maintaining the exemption at section 22(1) at this time." After not responding to our initial request for the postcode data, Shropshire County Council has now come back to us following our FOI request. Whilst it has published a map on its website giving a rough guide as to where the broadband roll-out will fall, it has denied us the postcodes, citing section 42 of the FOI Act - protecting commercial interests. "Disclosure of specific post code roll-out data is considered to be commericlally sensitive... [and] in considering the "public interest", we consider that on balance that it is not in the public interest to disclose the information requested," it wrote. "In arriving at this conclusion we have taken into account the current commercial confidences to which the Council are committed and the circumstances in which the information has been provided to the Council." The council has responded to our FOI request by saying it considered its answer under the Environmental Information Regulations 2004 (EIR) instead as the programme for broadband coverage involves structures, cables and ducts affecting land and landscape. However, even examining it under these other regulations has led West Sussex to the conclusion it cannot share postcode data to protect commercial interests - section 12 (5) of the EIR. "The schedule containing data linked to postcodes is information regarding the pre-contractual negotiating position and/or technical information which is confidential in nature," claimed the spokeswoman. "The analysis was a key part of the process resulting in an agreed programme and this process was undertaken on the basis that the data would remain confidential until a future planned staged disclosure." "Disclosure of the data would be likely to create an unfair advantage to competitors not obliged to disclose similar data." The council has promised a "planned staged disclosure" over the coming months but has set to exact timetable. West Berkshire council has published a coverage map showing areas where it will and will not be rolling out broadband here. However, it claims it does not have a definitive of coverage at postcode level. We have submitted an FOI request to get this data and await a response. UPDATE: West Berkshire has replied to our FOI request telling us it does hold the data to 'sector level' - e.g. RG14 5?? - but it will not share it because the accuracy of the data is subject to survey work being conducted by BT and, as in so many cases now, it has signed a non-disclosure agreement to not share such data publically to protect BT's commercial interests. We have still yet to hear anything from Cumbria County Council and have not received a reply to our Freedom of Information request either. However, a source has sent us a document containing what they believe to be the current postcode data. We have published the list here (click for link). We have forwarded a copy to Cumbria County Council to validate it and await its response. "An ‘Invitation to Tender’ issued on 2 October 2013, and closed on 8 November 2013. It is anticipated that a contract will be signed by the end of this year, with implementation completed in 2015." After being ignored by the press offices of the councils involved in the Greater Manchester broadband project, Computer Weekly did receive a response to a Freedom of Information request, but no information was shared. "The Greater Manchester broadband project is still in the early stages of development," it read. "We are therefore unable to provide detailed information on rollout plans at this stage. We will be working closely with BT to provide information showing the areas to be included within the project as soon as it is available."